DiscountPaint.net :: MANUFACTURERS :: MODERN MASTERS :: Metal Effects :: MODERN MASTERS 39606 ME-396 REACTIVE METALLIC PAINT BRONZE SIZE:6 OZ. MODERN MASTERS 39606 ME-396 REACTIVE METALLIC PAINT BRONZE SIZE:6 OZ. Metal Effects™ water based Bronze Metallic Paint contains real bronze particles. This paint will tarnish naturally over time and when exposed to the elements. 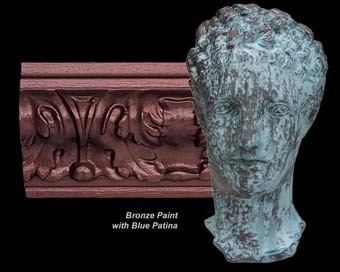 Metal Effects™ Blue Patina Aging Solution, when used in combination with Metal Effects™ Bronze Metallic Paint, creates a beautiful authentic blue patina. Metal Effects™ Bronze Metallic Paint is a water-based modified acrylic paint formulated with real bronze particles. It will oxidize naturally over time and when exposed to the elements. Metal Effects™ Patina Aging Solutions will speed up the oxidation process to create a beautiful, authentic patina on any paintable surface. Metal Effects™ Bronze Metallic Paint can be brush, roll, or spray applied with an HVLP sprayer. It is ideal for use on properly prepared metal, wood, plaster, canvas, paper, or plastic surfaces. Popular applications include moldings, trim, columns, doors, furniture, rain gutters, railings, lamps, vases, and planters. Step 2: After the primer has fully cured, the surface is ready for a base coat of Metal Effects™ Bronze Metallic paint. Apply using a brush, roller, or an HVLP spray gun. To spray add up to 20oz./600ml of water per gallon of paint. For brushing, use a highquality brush made for water-based paints. Allow this first coat to dry for approximately ½ hour. Step 3: In the same manner, apply a second coat of Metal Effects™ Bronze Metallic paint. The Metal Effects™ Blue Patina Aging Solution should be applied while this second coat is wet (within approximately five (5) minutes). Apply the Blue Patina Aging Solution with a brush, sea sponge, spray bottle, or attach the spritzer cap directly to the 4 or 16 ounce Patina bottles. If an evenly patinaed surface is desired, stipple the wet surface with a brush or block stippler to evenly distribute the Blue Patina Aging Solution. In approximately 30 to 40 minutes, a true patina will appear. Cold temperatures or high humidities will prolong the patina oxidation process and dry time. Coverage: ME396, 1 gallon/3.78 liters will cover approximately 300 sq. feet/28.8 sq. meters. ME396: Drying time at 70°F and 50%RH: Re-coat time is in approximately ½ hour. Dry time is in approximately one hour. Full cure is in approximately 24 hours. Lower temperature and higher humidity will lengthen the dry and cure times. DAP 18172 ANTIQUE WHITE ALEX PLUS CAULK SIZE:10.1 OZ. PACK:12 PCS. UGL 11413 ZAR 114 PROVINCIAL WOOD STAIN SIZE:1 GALLON. WHIZZ 57590 PREMIUM FOAM ROLLER WITH 13" TWO COMPONENT SOFT TOUCH HANDLE SIZE:4" PACK:10 PCS. VALSPAR 2400 MEDALLION INT LATEX SEMI-GLOSS WHITE SIZE:QUART. 3M 70523 17026 DECORATING CLIP (CONTAINS 20 CLEAR CLIPS & 24 STRIPS) PACK:12 PCS.